An adventure in half a day to remember for all your life. Our Valdez Glacier and Iceberg tour begins at Valdez Glacier Lake, past the airport at the end of Glacier Campground Road. There we will meet you with a canoe, life jackets, and a small waterproof case that you can keep your phones or camera in, if you desire. Pick-ups and drop-offs are possible, however they will be considered part of the tour time so we can keep to schedule. This private tour can accommodate groups as large as 8 people. No canoe experience is required. Guides doing the paddling, participants may paddle if they would like to do so. One in 30 tours we experience winds on the lake and may request participants to help paddle. We will canoe out to Valdez Glacier where we walk along the top of the floating portion of the glacier, exploring the glacier and its ice caves. This portion of the glacier is very active and changing all the time. Quantity and quality of ice caves can vary. Generally the walking portion is 2-3 hours of mostly level walking at a relaxed pace. On the ride back we spend time exploring the icebergs. The option to walk on an iceberg exist if a suitable iceberg can be found for safe exit and entry of the canoe. On cruise ship days this tour is NOT a private tour unless it is for a party of eight. Otherwise on cruise days this becomes a combined tour of two guides and six (possibly 7 if youth included) passengers. For the Valdez 2019 cruise season, these days are: May 13, 20 June 3, 7, 23, 24, 27 July 13, 17 August 2, 6, 20. Watching the sunset from inside the cave of an iceberg. Our guided tours on Valdez Glacier are lots of fun. Canoeing out around the icebergs of Valdez Glacier. The ice caves on Valdez Glacier are fun for all ages. A mom and dad take a selfie up on Valdez Glacier while the kids explore an ice cave below them. Swinging from an ice screw on Valdez Glacier during a tour. Friends stop to check out the layered ice caves on the Valdez Glacier tour. Friends stop in the entrance of an ice cave on Valdez Glacier that leads down in to the lake. Our guided tours get you to the heart of the glacier. A man practices using an ice screw on Valdez Glacier while on the glacier and iceberg excursion. A couple canoe into an ice cave on the iceberg canoeing portion of the tour. A woman rides an iceberg on our Valdez Glacier and Iceberg tour. A woman crawls through an ice cave of Valdez Glacier on a private guided tour. 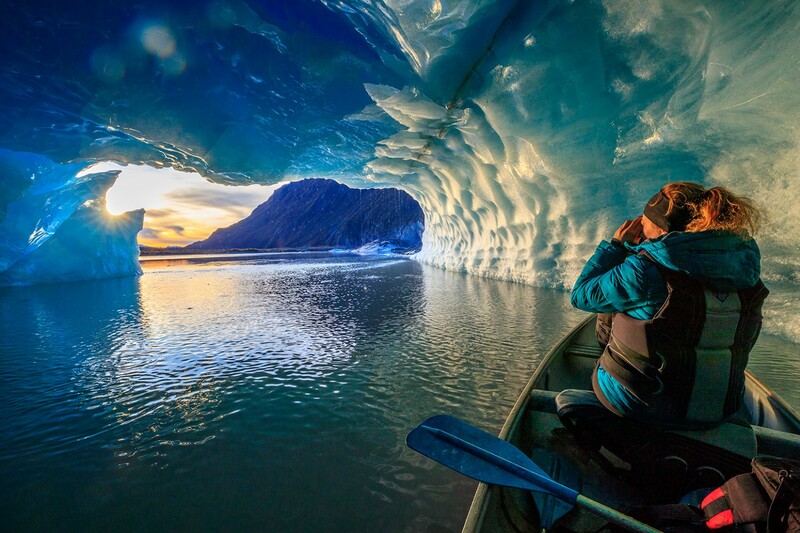 A boy canoes under an old drainage tunnel of Valdez Glacier. Our Valdez Glacier tour is a good time filled with laughs. Having a good time is an important aspect of our Valdez Glacier excursion. A grandpa and his grandkids smile while paddling out to a giant iceberg of Valdez Glacier. Our tours are so relaxing, come hang out with us and you won't be disappointed. Spots beautiful enough to visually hallmark where you asked the biggest question of your life. Out Valdez Glacier tour offers amazing views of blue glacier ice. The walk on Valdez Glacier is mostly level and relaxing with views that don't disappoint. This tour is great for families with young children as it is a private tour that moves at your own pace. The Valdez Glacier tour is a great easy adventure for families. Since 2015 we've had wonderful ice caves to explore out on Valdez Glacier. Great views of Valdez Glacier from on the glacier. The icebergs and glacier even look great on an overcast day. The Valdez Glacier tour usually features the option of going inside an ice cave. The Valdez Glacier tour gives you the opportunity to see the glacier from all angles. Walking through some of the uneven parts along Worthington Glacier, exploring further back. Occasionally we catch ice bridges on the Valdez Glacier tour. This tour is how you get inside Valdez Glacier. Every now and then we have tunnels that form through the heart of the icebergs. When conditions exists and are safe it's possible to canoe inside of a cave. This cave developed in 2018 and continued opening through the summer to become a massive crevasse. We find the best places to walk down inside the glacier. Drinking fresh glacier water while out on the tour.